SOUTH BEND, Indiana — Highlighting the kickoff to a yearlong celebration for the city of South Bend, Indiana’s 150th birthday (SB150), HARMAN Professional and Michigan-based sound contractor Stewart Independent provided live sound reinforcement for a Memorial Day Weekend concert featuring Ben Folds and the South Bend Symphony. SB150 is a community-wide celebration of the city’s rich history and will highlight the area’s best in arts, culture and heritage in a variety of events and programs. The concert, which took place on Saturday, May 23rd, was held in the parking lot of the South Bend Century Convention and Events Center with over 5,000 in attendance for the sold-out show. 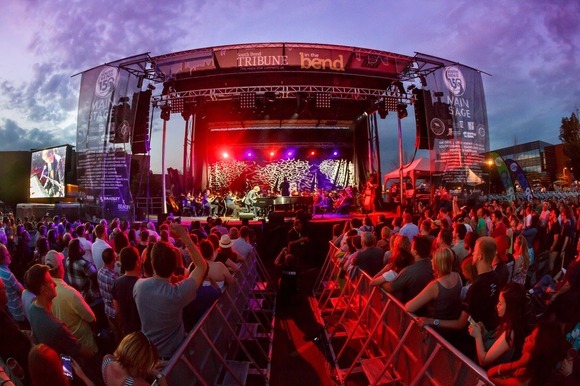 In addition to the one-time collaboration between Ben Folds and the South Bend Symphony, other regional music acts also performed at the event. The main stage system featured 10 JBL VTX V20 full-range line array elements and six VTX S25 subwoofer elements suspended per side for the PA. An additional 12 G28 subwoofers were ground-stacked in front of the stage in four groups of three. VTX F12 and F15 loudspeakers were used as front fills and out fills, respectively. Four Crown VRACK 4x3500HDs powered the V20 line arrays and S25 subwoofers, while all the G28 and F Series loudspeakers were driven by two Crown VRack 12000HDs. JBL HiQnet Performance Manager™ software handled system setup, calibration and control. A Soundcraft Vi3000 digital live sound console handled the front of house mix and Soundcraft Vi1 was deployed for monitors. Additional HARMAN gear included two dbx DriveRack 4800s and AKG D5 vocal microphones. “I was fortunate enough to have the complete support of HARMAN for the weekend. Raul Gonzalez from HARMAN was a real pro and we were pleased with how well the Crown VRacks and JBL VTX boxes went together, flew and ultimately handled the show. Clarity was good and the symphony sound stage was excellent. I think we all agreed that the new gear is among the best HARMAN had put forth to date and being big fans of compact, high-output line arrays this rig fits the bill. My engineers are also big fans of the Soundcraft Consoles so having a Vi3000 at FOH was a nice treat as well," stated Shannon Stewart, owner Stewart Independent. “HARMAN audio and lighting equipment can be found on the biggest stages in stadiums and arenas around the world and SB150 was a great opportunity to put our gear on display in the backyard of our Elkhart facility. We are extremely proud of South Bend and are honored to be a part of celebrating its history and looking forward to the future,” stated Scott Robbins, Executive Vice President of Sales, HARMAN Professional. “The Main-Stage Concert was a tremendous success, despite the struggles that come with producing a first time volunteer-based show for an entire city. My staff including Dan DeVisser, Mati Johnson and Austin Lanning and I couldn't be more pleased with the outcome however. This was in no small part due to the dedication of the Executive Director of Downtown South Bend, Inc., Aaron Perri, a very supportive Mayor and Chamber of Commerce and the countless volunteers and local businesses that worked to make this event possible. Also the local production companies did great work throughout the grounds, stretching down both sides of the river in South Bend,” added Stewart. SB 150 will continue throughout the year with additional events and programs to celebrate the city and provide a positive legacy for South Bend residents to build on the city’s proud history. Residents and organizations are encouraged to help celebrate the city’s milestone by hosting their own events throughout the year. For more information on the South Bend 150 Celebration please visit: www.sb150.com.